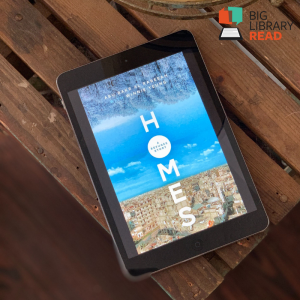 From April 1-April 15, OverDrive's Big Library Read is back with the eBook format of Homes: A Refugee Story, by Abu Bakr al Rabeeah and Winnie Yeung. In 2010, the al Rabeeah family left their home in Iraq in hope of a safer life. They moved to Homs, Syria - just before the Syrian civil war broke out. Abu Bakr, one of eight children, was ten years old when the violence began on the streets around him: car bombings, attacks on his mosque and school, firebombs late at night. As told to her by Abu Bakr al Rabeeah, writer Winnie Yeung has crafted a heartbreaking, hopeful, and urgently necessary book that provides a window into understanding Syria. Homes: A Refugee Story tells of the strange juxtapositions of growing up in a war zone: horrific, unimaginable events punctuated by normalcy – soccer, cousins, video games, friends. It is is the remarkable true story of how a young boy emerged from a war zone - and found safety in Canada - with a passion for sharing his story and telling the world what is truly happening in Syria. During the Big Library Read, the digital version will be available to all library customers to download for free, with no need to be on a waitlist. Homes: A Refugee Story can be read on major computers and devices. Like all of our eBooks, it will automatically expire at the end of the lending period, so there will not be any late fees. Read easier with Libby, OverDrive's app. Need help downloading? Check out our guides and blog on getting started with eBooks. Want to share your thoughts on the novel? During the Big Read event, you can discuss the book online at Overdrive's site, and here are some questions to get you started. You could also use the questions to spark a discussion with your friends. Stay tuned for the Big Library Read podcast, too. Abu Bakr al Rabeeah is currently a high school student in Edmonton. After three years of living in Canada, he enjoys his life there, but he also dreams of a future where he can return to help rebuild Iraq and Syria. Winnie Yeung has been an English teacher for over ten years. Homes: A Refugee Story is her first book and received extensive critical acclaim. It was shortlisted for the 2018 Governor General’s Literary Award for Nonfiction and is a contender for Canada Reads. When she is not teaching, writing, or reading, Winnie likes to spend her days cooking, baking, and playing with her black pug, Zoe. Edmonton, Canada is her permanent home, but her writing retreat/tiny home (named, The Mini Winnie, of course) is on Vancouver Island, Canada.